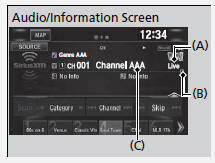 The system starts storing broadcast in memory when the power mode is turned ON. You can go back to the program from that point. You can no longer replay any program once the power mode is turned off as it erases memory. You can check how long the program has been stored in memory from the audio/information screen. After 30 or 60 minutes of recording the system will automatically start deleting the oldest data. When you listen a multi-channel preset while at the playback mode, the replayed segment is not displayed. 2. Select Go to Live.